Quick Response Manufacturing (QRM) is a strategy for reducing lead-times across all functions of an organisation. The resulting improvements in speed and responsiveness increase the organization’s agility and responsiveness, resulting in competitive advantage. Many well-known Lean Manufacturing tools have been developed for high volume/low variety, or ‘mass production’ environments. Think of techniques such a Pull Systems, Kanban, Line Balancing and Heijunka for instance, often applied to fast moving production lines. However, these tools often do not translate well to low volume/high variety environments, which require short batch runs, higher levels of customisation and fast response to changes in customer demand. For businesses facing the challenge of meeting increased customisation and speed, QRM is a strategy which relentlessly focuses on reducing lead-time both on the shop floor and in the office operations. Many hidden costs within a business are driven by long lead-times. Typical symptoms include excess inventories, planning difficulties, expediting costs, overtime, quality issues and so on. The result is often dissatisfied customers and a stressed workforce. By visualising the lead-time clearly and using one overriding measure to drive it down, the organisation will have clarity on its strategic goal and avoid confusion around conflicting objectives. The traditional focus on Resource efficiency has driven a high degree of specialisation into many organizations. Lead-time can become extended as a result, due to inflexibility (e.g. specialised equipment that suffers long changeover times, or specialised personnel that can only perform a narrow range of tasks – and frequently have long queues in front of them). In fast moving production environments the ‘bottleneck’ process often moves, so inflexible mass production systems are not the answer here. QRM Cells overcome this through a high degree of cross-training and autonomy, promoting flexibility for resources to move to where the workload currently is. QRM promotes Flow efficiency underpinned by additional capacity to keep the job moving, rather than holding additional inventory and applying Pull systems. Lead-time is related to capacity utilization, demand variability and lot sizing. High utilization is great for Resource efficiency, but damages Flow – think about this by comparing driving along a motorway at rush hour (highly utilized), to driving along the same road in the middle of the night! 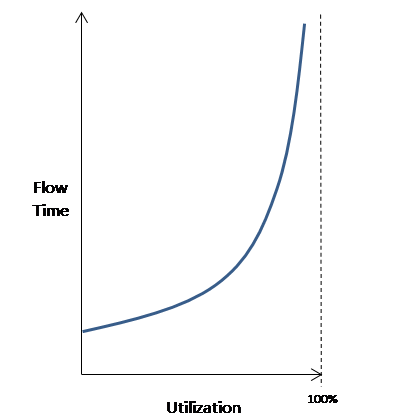 The Kingsman Curve is a well-known model that illustrates this phenomenon. The higher your utilization, the longer your queue is. Also, the higher your variation the longer your queue is. Underpinning Flow efficiency by maintaining spare capacity will help absorb variability in demand and protect lead-time reduction. 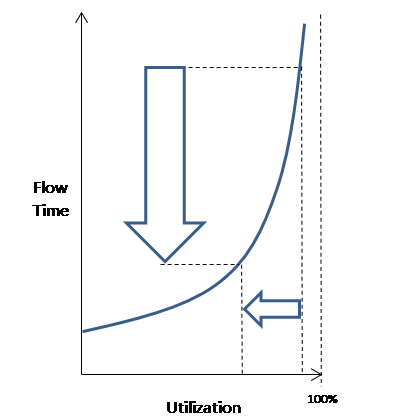 System dynamics will help managers to understand the impact that utilization and variability have on lead-time, and how even a small investment in additional capacity can generate a significant lead-time improvement. 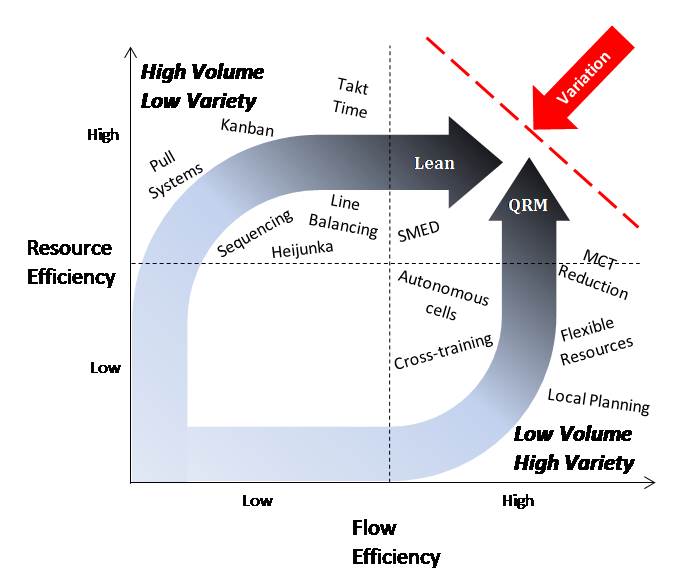 QRM is not just a shop-floor focused approach. Functions such as order processing, new product introduction, purchasing and supply chain management can all have a significant impact on the overall lead-time experienced by the customer. Office based QRM Cells can apply the same lead-time reduction philosophy to their processes to contribute to reduction in overall lead-time. As with any change management process, clarity of the goal and its benefits are essential to communicate. 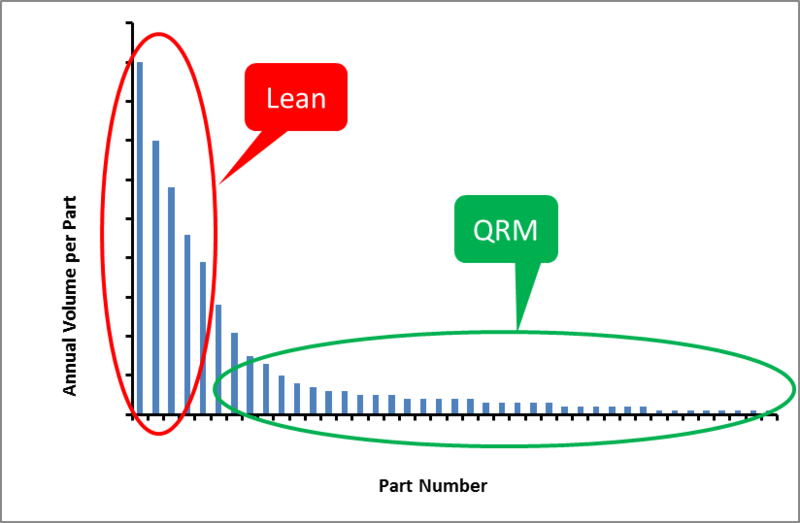 Remember, QRM is driven by the goal of lead-time reduction, to which all aspects of the business can contribute. Quick Response Manufacturing applies to every aspect of an organisation, is singular in its focus and simple to understand – generating competitive advantage through relentless reduction of lead-time. When Industry Forum first met Alcon, it’s fair to say it was on a journey. With its roots firmly in motorsport, Alcon recognised Lean tools alone could not deliver all the competitive advantage they sought for the dynamic ‘high variety-low volume’ marketplace they served. With the emphasis on agility, IF supported Alcon to introduce Quick Response Manufacturing techniques such as Manufacturing Critical-path Time (MCT), Focused Target Market Segments (FTMS) and QRM Cells and Q-ROCS (Quick Response Office Cells) – dramatically reducing customer response times. Find out what Alcon achieved with Industry Forum’s support, by introducing the Quick Response Manufacturing (QRM) approach. Get in touch and talk to us about how we can help you? Industry Forum can provide a range of improvement solutions across your organisation’s entire manufacturing operations. We don’t offer a one size fits all approach, instead we get to know your organisation, your people and the environment within which you operate before working with you to find an approach that is tailored to your requirements, meeting your needs and addressing your most pressing challenges. Whether it’s Lean Manufacturing, Manufacturing Leadership, Six Sigma, QRM or Total Productive Maintenance, Industry Forum can provide you with a range of expertise to support initiatives from large manufacturing improvement programmes across a multi-site organisation to single projects in an individual plant.